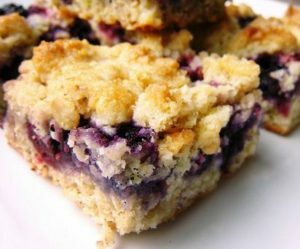 Soft and moist cake with fresh berries and crumbly topping. Blueberries, raspberries, strawberries or any other berries in season, make this cake a versatile treat for breakfast, brunch or anytime of the day. Serve it as is or with a dollop of sweetened whipped cream or vanilla ice cream. Here's an easy dessert recipe for Berry Crumb Cake. Preheat oven to 350°F (175°C)*. Lightly grease a 9-inch baking pan with vegetable shortening. In a large mixing bowl, add all of the ingredients for the cake except for 2 tablespoons of the flour and the berries. Beat the mixture using an electric mixer on low speed just until dry ingredients are combined with the wet ingredients. Turn mixer speed to medium high and continue beating for 1 1/2 to 2 minutes until cake batter is smooth; set aside. In another bowl, combine the reserved 2 tablespoons flour with the fresh or frozen berries; add to the cake batter and gently fold in until fully incorporated. Spread cake batter into prepared baking pan. To make the crumble topping, combine sugar, flour and cinnamon in a mixing bowl and cut in the cold butter using a pastry blender (or a knife and fork) until mixture resembles coarse crumbs. Sprinkle crumb mixture evenly over cake batter. Bake cake in preheated oven for 35 to 40 minutes, or until a wooden pick inserted in the center comes out clean. Serve with sweetened whipped cream or your favorite ice cream.